If you haven’t read P. G. Wodehouse, you have no right to say that you have lived and you really should remove such claims from your business card. What matters it, if you have read the entire Summa backwards in Latin, or the Complete Works of that Bard chappie, Will Something Something. Sir Pelham Grenville Wodehouse (pronounced just as one would expect – “wood house”) lived from 1881 to 1975. He was in his prime among the upper class British of London and New York during the nineteen twenties. To the delight of millions of readers, he stayed there for the remainder of his life. He poked fun at the era in short stories, novels, plays and songs with a mixture of looniness and gentleness. Yes, but is he deep? You ask. Deep? Oh surely. Deep as a birdbath in a dusty July. A largish birdbath. Yet, there are glimmers of the workings of human nature – that blighted thing. Let us take the example of Teddy Weeks in Ukridge’s Accident Syndicate. Teddy is a dashed handsome cove, an aspiring actor don’t you know, with “melting eyes, mobile mouth and corrugated hair.” But he’s broke. And so are all his friends. Without a bob to buy a decent suit he can’t convince an agent to take him. Along comes Stanley Featherstonehaugh (pronounced as one would expect – Fanshaw) Ukridge with an insurance scheme. The friends will form a syndicate. They’ll raise enough money to take out health insurance for whichever member of the group draws the short straw. Then that person will simply go out and get himself into an accident. “Dog bites were specifically recommended as things that every subscriber ought to have.” Teddy draws the short straw but then, as so often happens in cases like these, refuses to the manful thing. As I say, Wodehouse had human nature in the bag all right. Can we not relate to the embarrassment of an eccentric relation who drops by just when we are trying to impress a proper guest? Hasn’t every young gentleman fallen for a pretty girl who gets him to fork over cash for the man she secretly loves? Old Little struck the literary note right from the start. “My nephew has probably told you that I have been making a close study of your books of late?” he began. He gazed reverently at me. “Oh, it’s just a knack,” I said. Perhaps it must be admitted, Wodehouse does not rank alongside the deep writers of the twentieth century like Hilaire Belloc, Evelyn Waugh and George Orwell. He ranks above them – at least according to Belloc, who called him, “the head of our profession.” Waugh lavished praise in back cover blurbs. “Mr. Wodehouse’s idyllic world can never stale.” Orwell topped them both by writing a defense of Wodehouse when he needed it most. 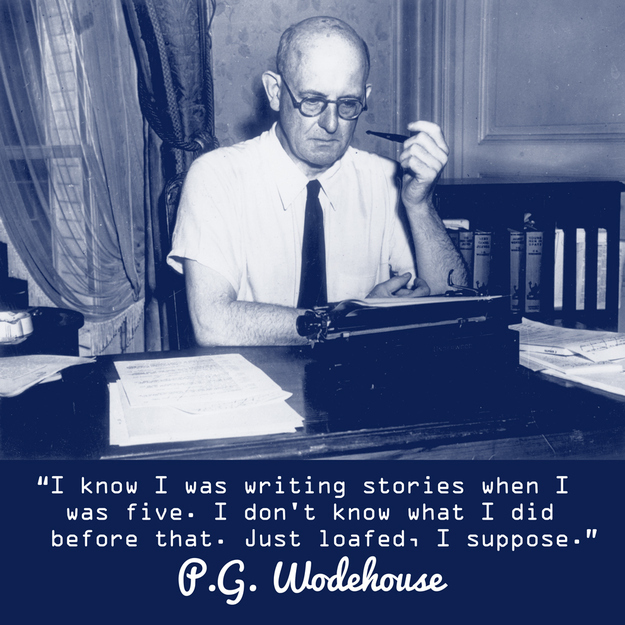 He called Wodehouse “naïve,” “stupid,” and “a political innocent.” And I’m sure he meant it most affectionately. You see, Wodehouse had gotten himself knee deep in the soup with the Nazis. He was not the sort of egg to mix himself up in politics. So it had no choice but to mix itself up with him. He was captured by the Germans while living in Belgium in 1940 and at one point interned in a camp in present day Poland. It was then called Upper Silesia. Wodehouse noted, “If this is Upper Silesia one wonders what Lower Silesia must be like…” When dealing with Nazis perhaps it is advisable to keep one’s sense of the ridiculous. His nearly fatal mistake was using his humor to make a series of radio broadcasts for them. In his mind he was reassuring his American public that he was unharmed. Britain, however, reacted. Wodehouse was accused of complicity with the Nazis. Orwell pleaded that all he was guilty of was allowing himself to be tricked. “If we drive him to retire to the United States and renounce his British citizenship, we shall end by being horribly ashamed of ourselves.” After an investigation, the British authorities agreed and cleared his name. Nevertheless, Wodehouse and his wife (their daughter had died during his captivity) moved to New York, returning to England only in stories. Britain eventually let bygones be bygones and all that sort of thing. They gave Wodehouse a knighthood at last. The Queen Mother, a fan, even offered to go the US and give it to him personally as he was too aged to attend. The Brits got the job done just under deadline. Wodehouse lasted another six weeks. Dismiss your servant in peace and all that. Wodehouse was not a Catholic. Yet well educated and devout Catholics are some of his most avid and articulate fans. Some no doubt, pray for his soul with a sense of gratitude. Practically speaking, the reader leaves a Wodehouse book a dashed sight smarter. It’s a bit like reading that Bard chappie. Patience and vigilance at the outset then, at the finish, a life membership to the in-club which gets the jokes. To an aspiring writer, his style is the very anti-dote of triteness. Watch and learn. One really ought to throw a rosary or two his way from time to time. So much for the practical benefits of reading Wodehouse. I go no further. Even in moments of rabid homeschool zeal, I would never think of making his work an assignment. A sure way to quash a burgeoning devotion is a book report. Wodehouse was, is and always ought to be what he was designed for – an escape.